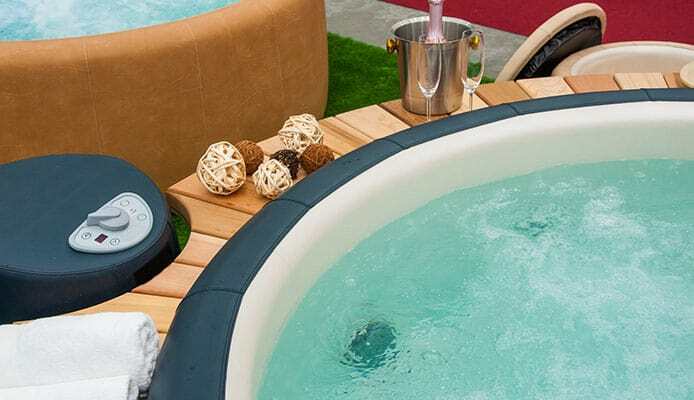 Bestway are one of the industry leaders when it comes to hot tubs, they continue to produce high-quality products that are perfect for fun or relaxation. With plenty of different products, it’s important that you know how to choose the best Bestway hot tub for you. Here we aim to find the best Bestway inflatable tub that is going to give you everything you’re looking for. In order to do that we have created a buying guide and have also completed Bestway hot tub reviews to show you what your options are. Once you have finished reading, you’ll know exactly what you need. 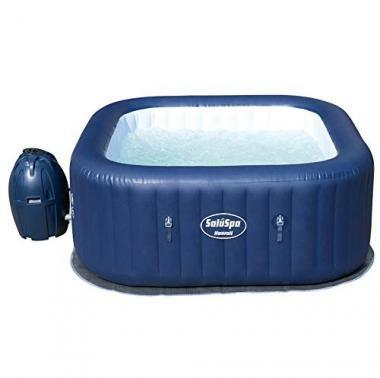 This is a top rated Bestway inflatable hot tub that is going to be able to give you many hours of relaxation. It is easily set-up and is going to be able to accommodate 4-6 people to enjoy the fun of your hot tub. The walls are made out of a tri-tech material that is not only going to give you a high level of comfort but they are also going to be highly durable too. There are 114 individual jets to give you the ultimate in relaxation. 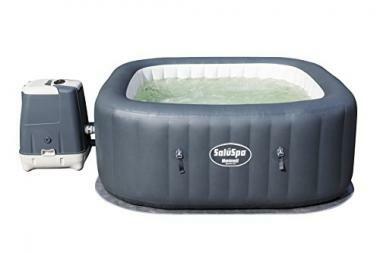 This Bestway inflatable spa is another great product from the company. 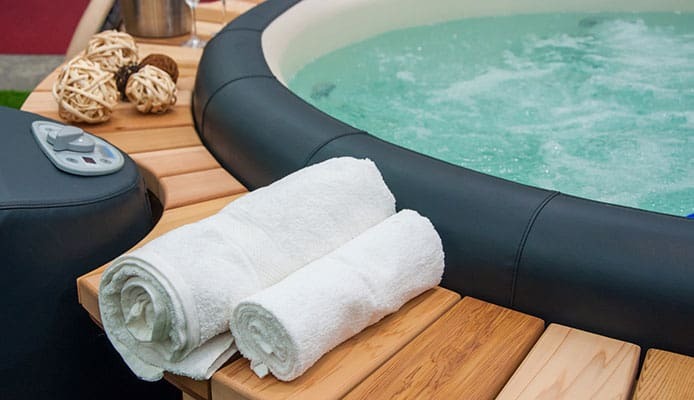 Like with all Bestway products, the set-up is very easy and is only going to take a matter of minutes and no tools are needed to get the hot tub up and running. One of the great features of this product is the fact that it is able to produce a light show and switch between seven different colors. It is very easy to operate and will give you a unique experience while you are enjoying your hot tub. This Bestway SaluSpa is another great product which is similar to the Bestway SaluSpa Miami. It has a capacity of 4-6 people which should be enough for your needs and will help to ensure that you have a great time while you are enjoying those jets. The Bestway lazy spa will be able to heat up rapidly to allow you get in shortly after you have set it up and it has a water filtration system to ensure that the water stays clean. The soft walls of the hot tub will allow you to relax in comfort while still being durable. This is another great product from Bestway but one that comes in a different shape. It effectively works as a large bathtub for two people to be able to relax with the large amount of space it has and the jets that it is able to provide. The material it is made from is highly durable to give you peace of mind and the massage system will loosen up your muscles and allow you to unwind. It has an automatic timer that is going to help you save energy. This product from Bestway has an advanced HydroJet system that is going to be able to give you a great level of massage. This product also comes with a thick insulated top cover that is going to be able to lock in the heat when it’s not being used. The Bestway lay-z-spa is also able to heat up very quickly and it will also be able to clean the water with its filtration system. It’s designed to fit up to six people and the set-up of the hot tub is going to be very easy and allow you to be able to enjoy it in a matter of minutes. 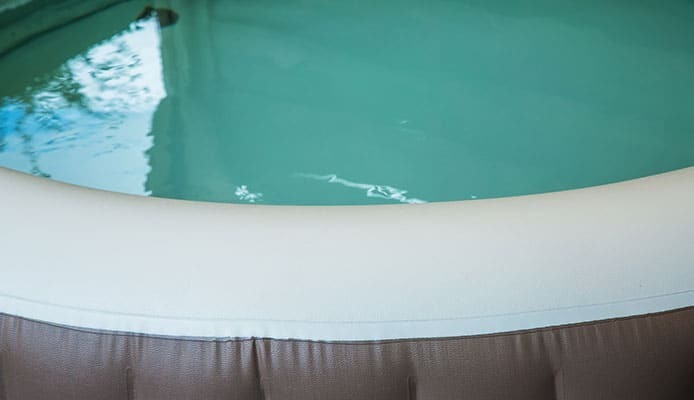 One of the best features of these Bestway hot tubs is just how easy they are to set-up, especially with this 10 steps guide to setting up an inflatable hot tub. When compared with other types of inflatable hot tub, this is very quick and will allow you to start enjoying it in no time. It should only take a matter of minutes and can easily be done by just one person. All of the products we have reviewed here have a similar set-up which is a simple process. Not only will the installation time be quick but the water will be able to heat up quickly. Hot tubs aren’t generally designed to be able to hold a large number of people and a lot of the time they will just be used by one or two people. 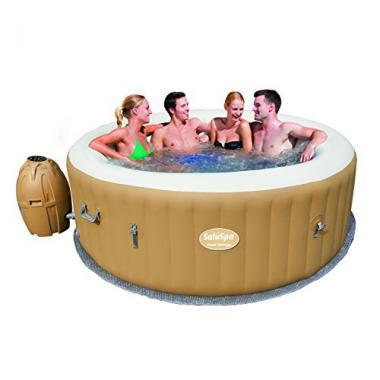 Most of these hot tubs we have featured will be able to hold up to six people, with four being an ideal number. There are products such as the SaluSpa Siena have a different shape and is going to be ideal for two people. This is depending on your needs and who is going to use it. Hot tub spa maintenance is very easy with these products, especially with their filtration systems. One great added accessory to have when it comes to hot tubs is an insulated lid that will be able to sit over the hot tub when no-one is in there. This is going to help speed up the process of heating our keep the heat locked in if you plan on going back in after a short break. There are some great hot tub accessories that you can buy too. A hot tub can be good for you for many different reasons as the gentle massage of the jets is able to help loosen up your muscles and release any tension. A long soak is going to be able to help you recover from exercise and other strains. Before you decide to buy your hot tub you need to work out what size you need. This is obviously going to be decided by a few factors with perhaps the biggest being the amount of space you are going to have available to put it in, therefore it’s important to where to put a hot tub. Once you know this, you will be able to look at the dimensions of your hot tub and get yourself a product that is going to be suitable for your needs. Another key consideration is how many people are going to be using it. Most hot tubs come in a standard shape with that being the standard circle that you will often see. 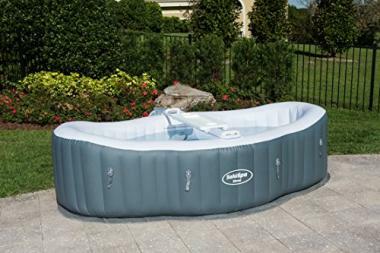 This allows for an easy construction when it comes to making an inflatable hot tub and will allow you to have it up in very little time. There are other shapes available as we have seen. If you planned on relaxing with your partner then getting an enlarged bathtub shape is going to be a great idea. This will allow you to relax and have a romantic soak with the one you love. It’s always a good idea to look at what type of jets are available when you are going to purchase a hot tub and what type of function they are going to have. Some are more powerful than others and some have different settings. Different types of massage can be offered to give you different levels of relaxation. Some jets are also adjustable will others will have different settings. It’s a good idea to see exactly what your hot tub can do and how that is going to best fit your needs. The products that we have featured here are going to be very easy to use and allow you to easily change the settings of the hot tub. This is important as you don’t want to have to spend half an hour trying to work something out. Having other features can be great too such as a rapid heating system that will prevent you from having to impatiently wait for your hot tub. Power saving modes are also brilliant as this is going to save you money and reduce tour energy output. It’s always going to be important to keep your hot tub nice and clean but a large part of that will be done by the hot tubs filtration system. These Bestway hot tubs will have an in-built filter that is going to be able to clear away most debris. It’s a good idea though with inflatable hot tubs to drain out the water every now and again in order for it to be replenished. There are hot tub cleaners out there for the times when you need to give your tub a more thorough clean. Q: Why Choose Bestway Hot Tub Over Other Hot Tubs? A: Bestway are experts in making hot tubs and have been able to deliver a wide product range that is going to be able to give you everything that you need from a hot tub. They are highly convenient, easy to use and with a number of great features that will ensure that you will be happy with your hot tub and use it time and time again. Q: Why Choose An Inflatable Hot Tub Over A Regular Hot Tub? A: There are a few great advantages to having an inflatable hot tub and one of those is the added convenience that they have. They are able to be stored away and not take up space when not used. They will also be a lot cheaper and therefore they are great for those who have a confined space and who don’t want to pay a huge sum for a regular hot tub. Q: Can I Set Up My Bestway Hot Tub On My Own Or I Need A Professional To Do That For Me? A: One of the hallmarks about Bestway is the way that their hot tubs are able to be set-up. They only take a very short amount of time and can easily be done by just one person. This should only take a matter of minutes and you’re not going to need a professional in order to help you. Q: What Other Accessories Will I Need For My Bestway Hot Tub? A: There isn’t much else you are going to need for your Bestway hot tub as everything will be included in their package. There are some great hot tub accessories out there though great accessory to have is an insulated hot tub cover which is going to be able to save a lot of energy with not having to reheat the hot tub as much as you would do otherwise. A hot tub can be an amazing way to spend time relaxing or having fun. 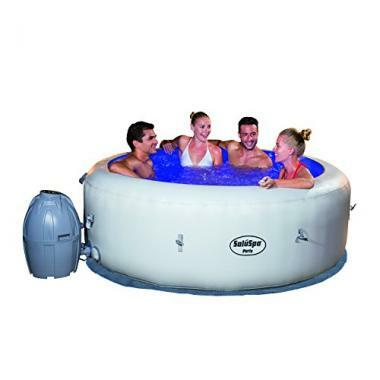 These Bestway models are a brilliant way to have an excellent and convenient hot tub that allows you to set it up whenever you need but also allows you to store it when it’s not required. It’s important to take proper care of it though and using the right hot tub cleaners and hot tub filter cartridges is going to be important. Also, getting hot tub steps will ensure that you are safely getting in and out of the pool and getting the right PH balance is important too. In order to find the find the best hot tub or you, size is going to be a big consideration, not just for the space that you have but also for the number of people who are going to be using it. After that, the space, jet type and features are also going to be important. Now that you have all the information that you need, you will be able to choose the Bestway hot tub that most closely matches your needs. Once you have your perfect model, you will be able to enjoy all the benefits that a hot tub can offer.